Because of other obligations, I couldn’t really do a full-scale Field Day in 2011. I was determined to make up for it in 2012. I had a mission for this year’s Field Day, motivated by the operating event’s roots as an exercise in emergency preparedness. 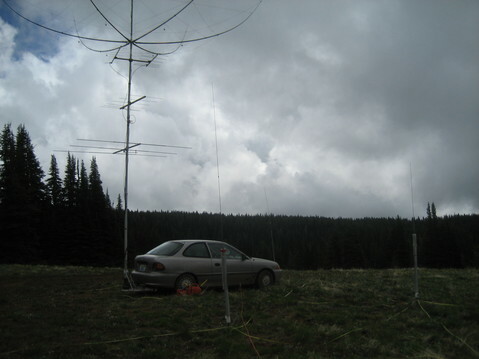 My mission was to activate a one person HF through UHF portable station that could be rapidly deployed. Beyond that, I wanted to push myself to have something of a “big signal,” even as a low power solo station. Oh…and I wanted to do this out of my little econobox car. Part of the plan to do this was easy—Washington state is rich with mountain peaks, a few of which have roads that are accessible at least part of the year by low-clearance consumer-quality stock urban commuter automobiles. One of the best spots near the Seattle area is Lion Rock Spring Campground at 6,200′ on Table Mountain in the Wenatchee National Forest. 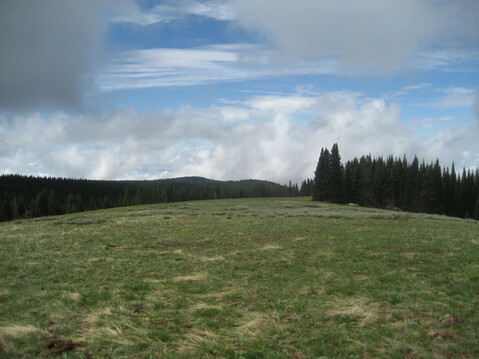 This is a primitive campground, but one with good vehicle accessibility. A paved national forest road gets one pretty close to a number of camp sites. I learned about Lion Rock from N7CFOs rover web site. My uncertainty about it was its accessibility in late June. I called the ranger station. A friendly person told me that the road conditions to Lion Rock were uncertain—campers had recently reported some snow on the roads near the site. He also mentioned that there were other hams who had contacted him as well, so I might expect company. 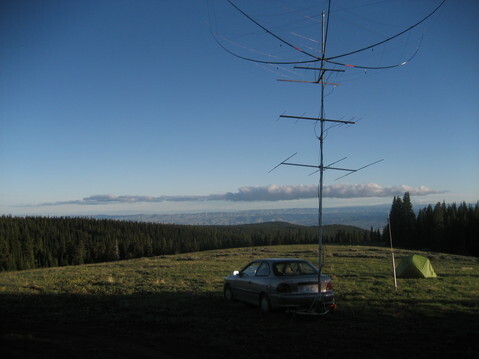 Indeed, when I arrived with a stack of VHF antennas on my car, the main camp site was populated with campers, trucks, and antennas sprouting all around. The first person to greet me was Lynn, N7CFO, who told me there were several other hams from the east suburbs of Seattle setting up as well. Given the density of antennas already at the “prime” spot, I opted for a slightly lower site about 1/3 mile away (here) at 6,150′ that had a bit better exposure to the west. I had the entire campground to myself for the weekend, which allowed me to “spread out” with radials running all over the place. The meadow area in front of me had no snow, but the wooded area directly behind me still had a lot of snow. I also had a Winkeyer, a N8XJK Super Booster, and a home-built 10-port Anderson Powerpole power distribution box stuffed into the rack. 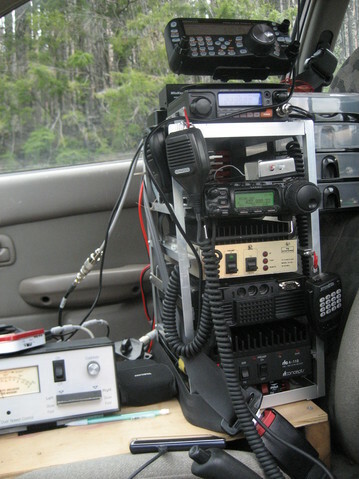 This set-up served me well during the ARRL June VHF QSO party. All I needed to add for a Field Day station was some HF antennas. For 80 meters and 40 meters, the choice was pretty simple: I would use my homebuilt screwdriver antennas with my “portable radial” kit. For 20, 15, and 10 meters, the solution was more involved. I wanted to build a field-deployable, fold-up hex beam. The target beam is the broadband version designed by G3TXQ, and with extensive construction notes by K4KIO. 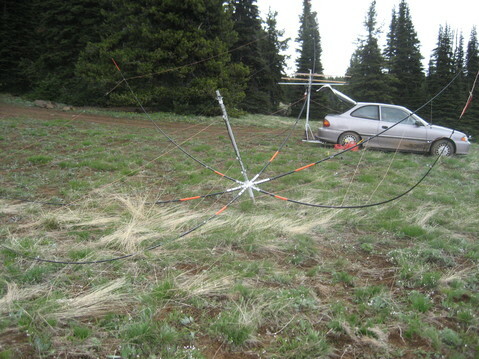 I built a hex beam of this type for home, and it is a wonderful antenna. To make it fold, a little design work and manufacturing was in order. Months before Field Day, I ordered six 14 foot crappie telescoping fishing poles off of Ebay. Only the first 12 feet or so of the poles are used. They are so thin near the end, I got them extra long and just used the first 12 feet. The hub is the heart of the hex beam. 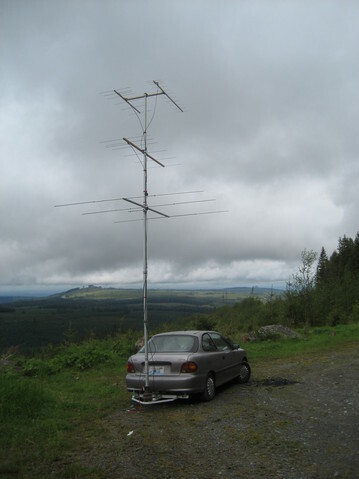 I wanted the spreaders to fold downward when not under tension, so that the whole antenna is no more than 8.5 feet long—the maximum length I could stuff into my car—with the spreaders folded down below the hub and the RF distribution post above the hub. Ideally, I would do the hub in aluminum, but I don’t have aluminum welding capabilities. So, I welded up a hub using a thin-wall 4130 steel tube for the center and mild steel angle and hinges for the rest. Essentially, I used six 3-inch pieces of 1″ steel angle welded around the tub, with the apex pointing “up”. Then, I made spreader supports of six 6″ lengths of 1″ angle steel and welded a small steel hinge on the bottom. The other end of the hinge was welded to the steel tube. 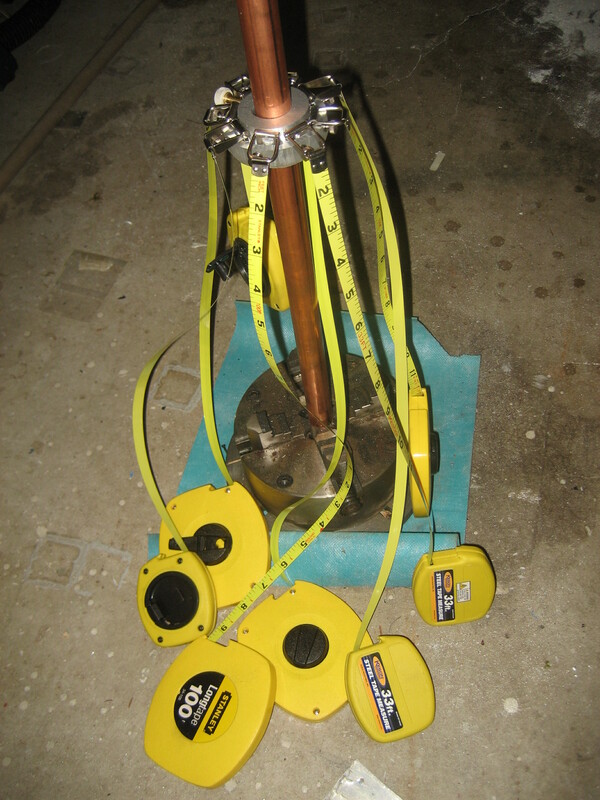 The hinge allowed the spreader supports to fold down against the tube, and fold out to be perpendicular to the tube, stopped and held in place by the 3″ pieces. Two stainless steel hose clamps held each spreader to the spreader support. A third hose clamp held the 3″ and 6″ angles together when deployed. The rope webbing was pretty conventional and made of 0.075″ Dacron-covered Kevlar cord with small stainless steel S-hooks on the ends. Attaching the wires to the spreaders was another trick. I essentially used 1/4 inch cable clamps for the wire to pass through. Through the screw hole, a tie-wrap held the clamp to the pole. The tie-wrap was sized to fit snuggly at the correct place on the tapered pole. During set-up, I wrapped one turn of electrician’s tape around the tie-wrap to ensure it didn’t slip. A 1/4″ over lap on one end of the tape made it easy to rip off. For wire, I used 14 gauge Flexweave™. The center RF distribution was a fiberglass pole with with the same type of Euro-terminal connectors recommended for the non-portable version. I connected the terminal connector to hose clamps so that each could be positioned as required. The big trick to making this work is to carefully bundle the wires. I used red tie wraps for all the ones that were to be “removed prior to flight.” This worked pretty well at keeping the wires from getting tangled. 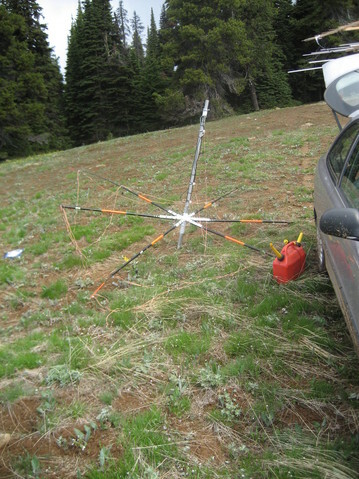 Setting up the hex beam was pretty simple, but required care to avoid tangling wires and creating a mess. Here we are with the screwdriver verticals added and just about ready to go…. The contest began at 18:00 UTC, but I didn’t get on the air until 19:30 UTC. The first couple of hours were only mildly productive, as I got comfortable with the operating position and fiddled with things. The hex beam was perfect, and needed nothing. I was unable to get my generator started (forgot the ether!) 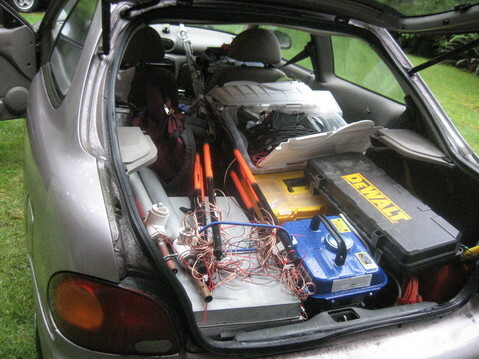 so, throughout the contest, I occasionally starting up the car to recharge the battery (and warm my feet). Six meters was strangely noisy, but the SWR was good. I later learned that the gamma match connection to the SO-239 connector had failed. Apparently, I had just the right length of coax to fool me into thinking everything was fine. This is a shame as I understand there was an opening on 6 meters for Field Day. It took me awhile to get comfortable with the operating set-up. 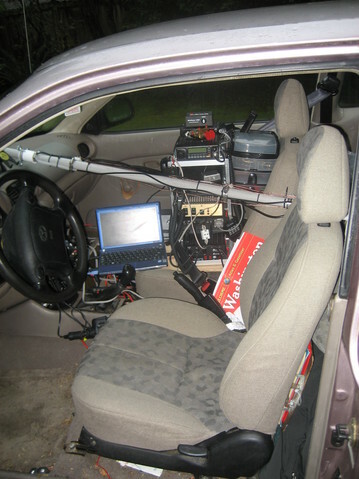 Operating in the driver’s seat is fine with paper logging, but using computer logging makes it very difficult to log quickly unless the computer sits on my lap. The problem is that I was attempting to operate with the laptop on the passenger seat. The day before the contest, I was testing out the equipment set-up and the connector on a USB hub broke off. “No big deal,” I though, “I’ll plug the three USB connections directly into the three ports on the computer.” Bad idea. The laptop was difficult to manipulate with three USB cables plus a power cord. At some point I bundled them together, and adjusted the slack so that the laptop could be moved around more easily. Working with the laptop on my lap top upped the QSO rate significantly and, as it happened, made it easier to use the paddle when needed from where the laptop use to sit. I spent the first two hours doing CW search-and-pounce on 15 and 20 meters accumulating only 33 QSOs. 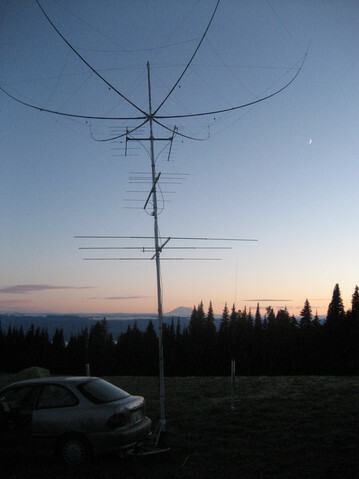 I turned to VHF and quickly worked three Seattle-area stations on 2 meters SSB. I also worked Lynn, N7CFO, on 6 meters—my only 6 meter QSO of the weekend. Back to HF, I searched and pounced productively on 20 and 15 meters both CW and phone for many more hours. I occasionally dabbled on 40 meters as well. It wasn’t until the nineth hour that I felt comfortable enough to do a serious CQ run. Even then, I was doing a lot of hand-keying. Using N1MM on a tiny netbook with a track pad instead of a mouse can be tough. Over the course of the contest, I gradually replaced mouse strokes with the keystroke equivalences, and gained the confidence to do everything via computer. Twenty meters was going strong at least until midnight (PDT), about the time I switched back to 40 meters, for a excellent search-and-pounce session that lasted until 08:30 UTC (1:30 am local). At this point, I opted for sleep over QSOs. My 3.5 hours of sleep was interrupted by additional hail showers and wind that had me concerned about the antenna farm. Alas, the wind sounded worse than it was from in the tent. I was back on the air by 12:15 UTC for a whole new batch of 40 meter stations to talk to. Thirty minutes later, I found 20 meters bursting with activity, and spent the rest of the contest splitting my time between 20 and 15 meters. On Sunday morning new thunderstorms brought enough hail to completely coat the ground with white for a spell, but things cleared up by the end of the contest. Conventional wisdom is that operating Field Day past 18:00 UTC Sunday isn’t worthwhile. I had until 19:38 to operate, and made the best of it. I ended up with an excellent 30 minute CQ run on 14,041 MHz at 18:42 UTC that brought in 30 new QSOs. After picking a few more scraps off the bones of 20 meters CW and phone, I finally called it a day (an “event”?) at 19:42 UTC. I ended up with 480 QSOs, or an average of 20 QSOs/hour for the 24 hours operating time I was allowed. That’s a QSO every 3 minutes. I contacted 68 ARRL sections, plus a bit of DX. All in all, not bad for my first serious field effort for Field Day since sometime in the late 1970s. VHF+ was disappointing, with only one 6 meter QSO (because of a broken antenna) and four 2-meter QSOs. It hardly seemed worth the effort on 2 meters and above—the time spent on these bands probably would have generated more HF QSOs. The trade-off is the ability to operate SO2R on HF versus using the same equipment as separate HF and VHF stations. 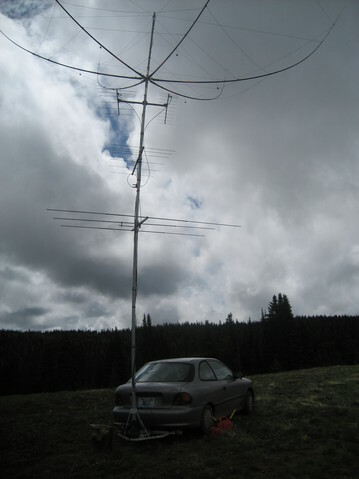 Six meters would have been okay with a functioning antenna. 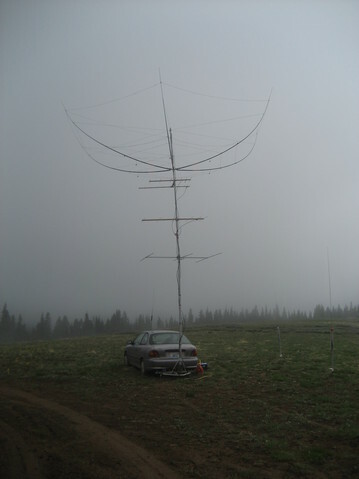 Perhaps next year I’ll add 6 meters to the hex beam and leave the VHF yagis at home. Or, I’ll try a new location that provides better line-of-site into the Puget Sound area. So many choices! This was a very satisfying experience. 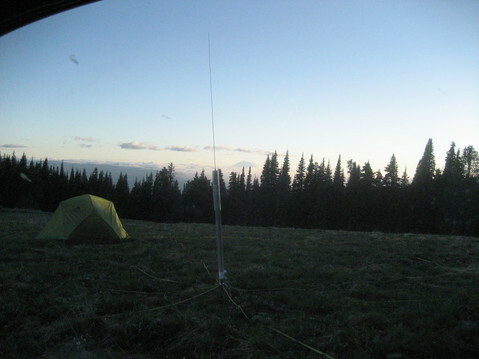 The HF set-up on 15, 20 and 40 meters (the only HF bands I ended up using) was terrific. The hex beam worked better than I imagined—essentially I could work everyone I could hear well enough to get a call sign for. Indeed, I almost felt like a “big gun” even running only 100 watts. …can’t wait to do it again!